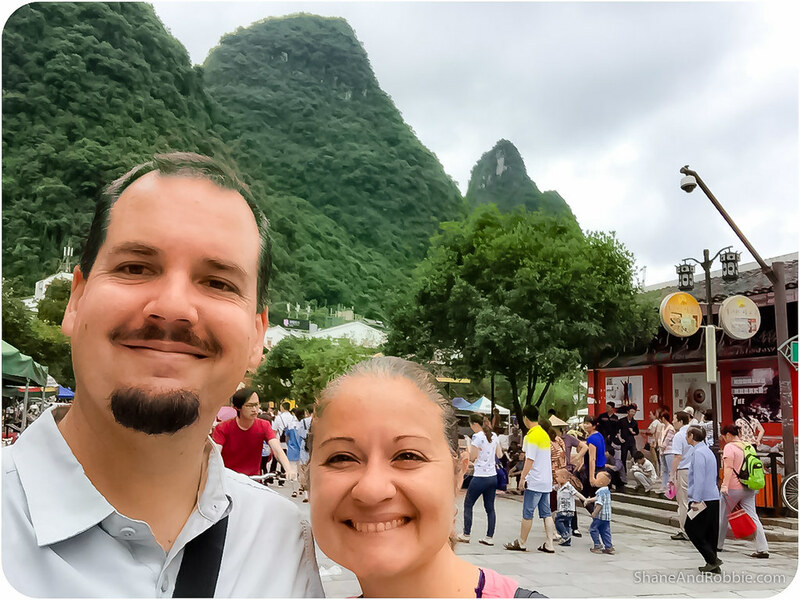 We took full advantage of today’s clearing skies and explored as much of Yangshuo and the surrounding countryside as we could in a day. 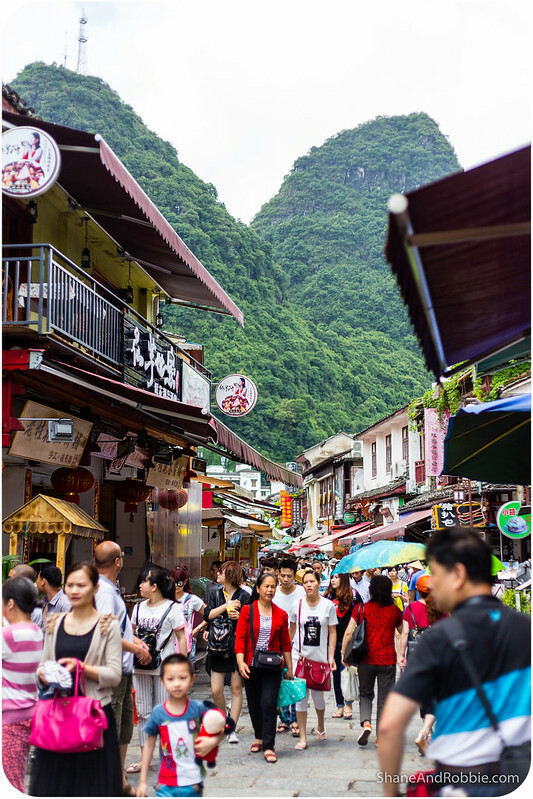 We got to see more of the lushly green karst mountain scenery, as well as explore some of Yangshuo’s rather touristy streets. This is a beautiful part of the world and one day just wasn’t enough! 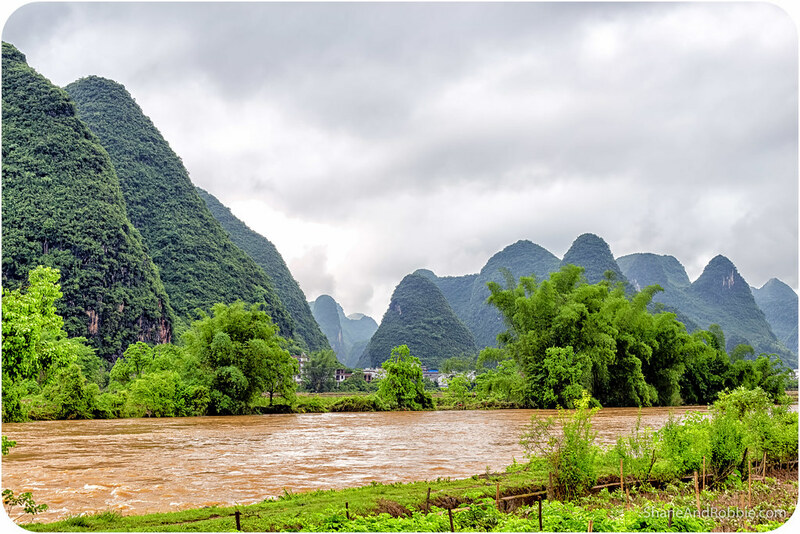 Yesterday’s rain continued on through the night, turning into an intense monsoonal storm that drenched Yangshuo and the countryside around town. We watched the lightening show from the comfort of our hotel room and marvelled as the streets around us turned in to rivers. We found out this morning that enough rain fell overnight to cause some localised flooding and swell the river to almost-bursting. 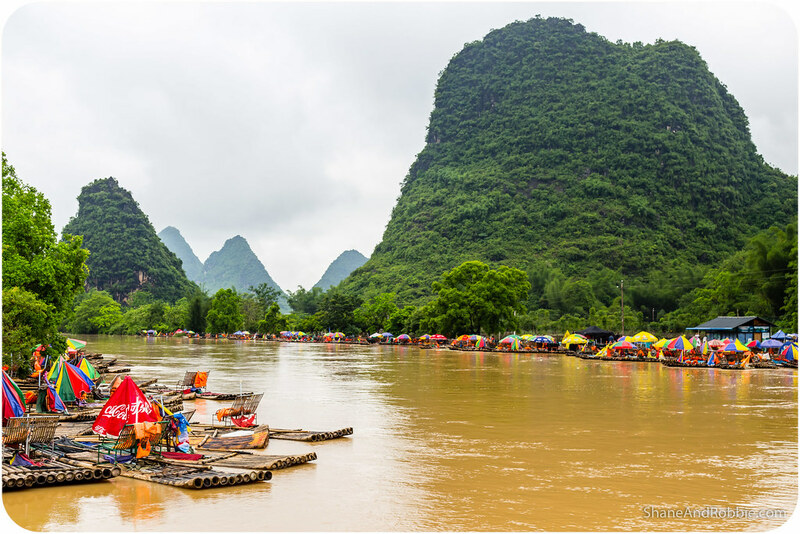 In fact, the level of the Li River is so high today that the cruise boats from Guilin have been cancelled. 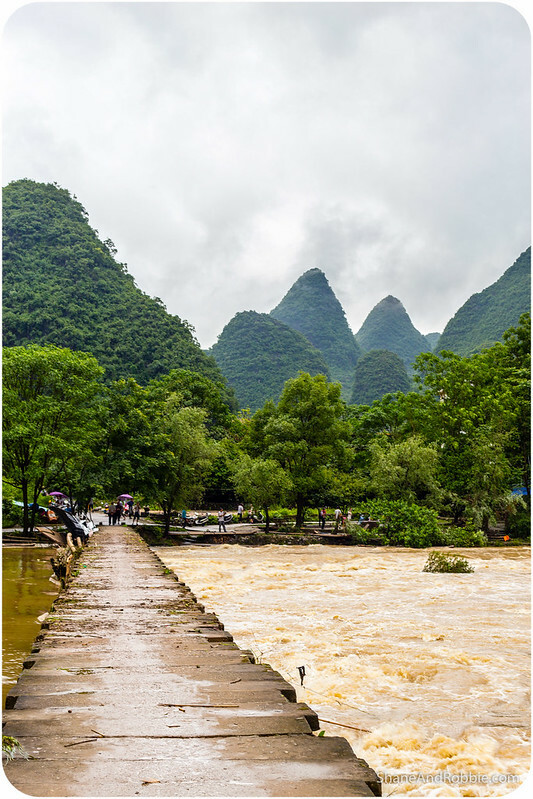 All those poor tourists stuck in Guilin – nothing like a bit of monsoonal weather to screw with your holiday plans! 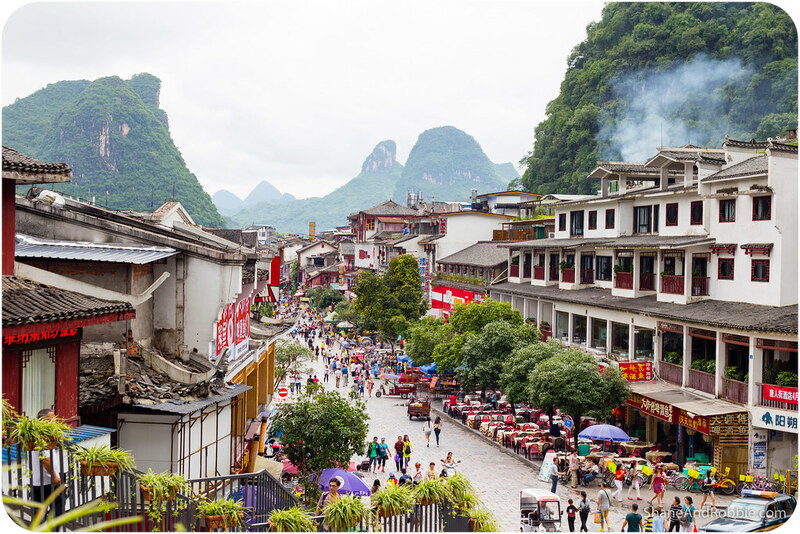 Lucky for us our plans for the day involved nothing more arduous or dangerous than a trip through the countryside around Yangshuo, some lunch with a local farming family, and an afternoon window shopping in town. Our visit into the countryside this morning took us along the Yulong River, a smaller tributary of the Li River. Normally this is a slow, lazy waterway that winds its way through rice paddies, fields of vegetable crops, and sleepy farming villages. Today it was a raging torrent of water, rushing past with tremendous force and carrying pieces of broken-up bamboo rafts and other debris downstream as it went. Many of the rice paddies and veggie patches had been flooded and looked more like little lakes than fields. Many of the farmers were out in their fields, assessing and trying to remedy the damage. We couldn’t help but admire their resilience and fortitude as we watched them wading through the muddy waters, up to their knees and waists in water. Farming is never easy, especially being at the mercy of nature and its whims. 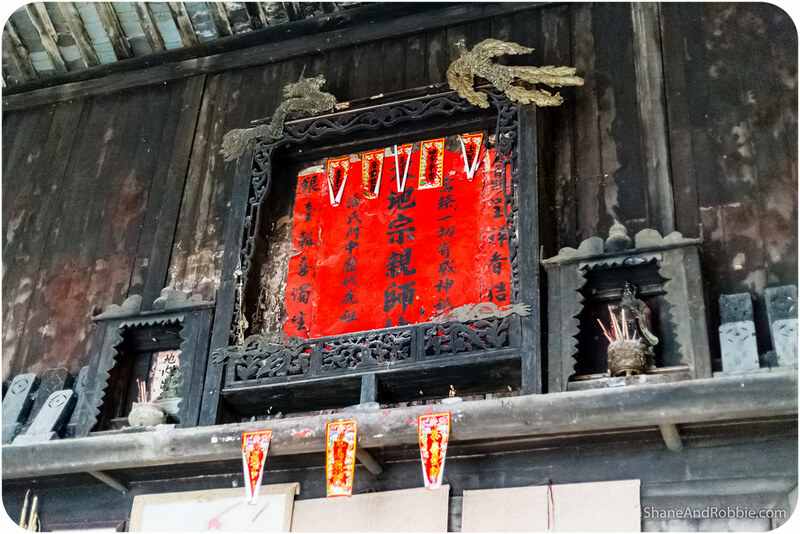 We spent the morning exploring the area around Yangshuo and stopped for lunch at an old farmhouse in the area. Built in the early 1700s this is the oldest surviving farmhouse in the region. The family’s antecedent was a general in the royal army and was granted their parcel of land upon retirement. Now the farmhouse is a local tourist attraction and the family that live there run a small restaurant. As they were preparing lunch we got to look through the original farmhouse, with its small inner courtyard and out buildings for the animals. It was such a simple design, but obviously well built and a sign of familial wealth. 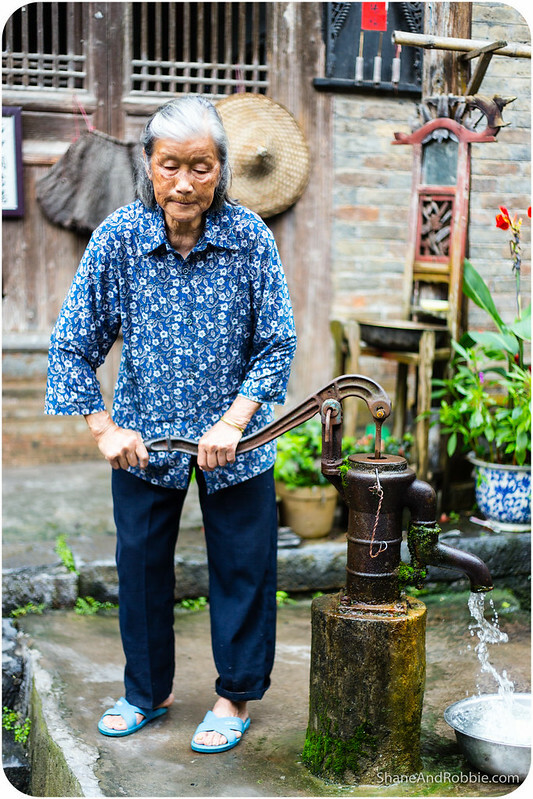 The farmer and his wife, now well into their seventies, showed us around the house with pride. They demonstrated how the original millstone was used to grind soy beans for making tofu and soy sauce; how well their water pump worked (a real luxury in times when running water had to be fetched by hand, no doubt! ); and even gave us oranges to eat, plucked straight from their trees. Lunch was fantastic – stir fried duck with chilli and garlic (sooo much garlic! ), thin slivers of beef with freshly picked vegetables, chilli and broad-beans tossed in the wok, and the ever-present bowl of rice. We ate heartily, but remembered to leave a bit of everything on each dish*. 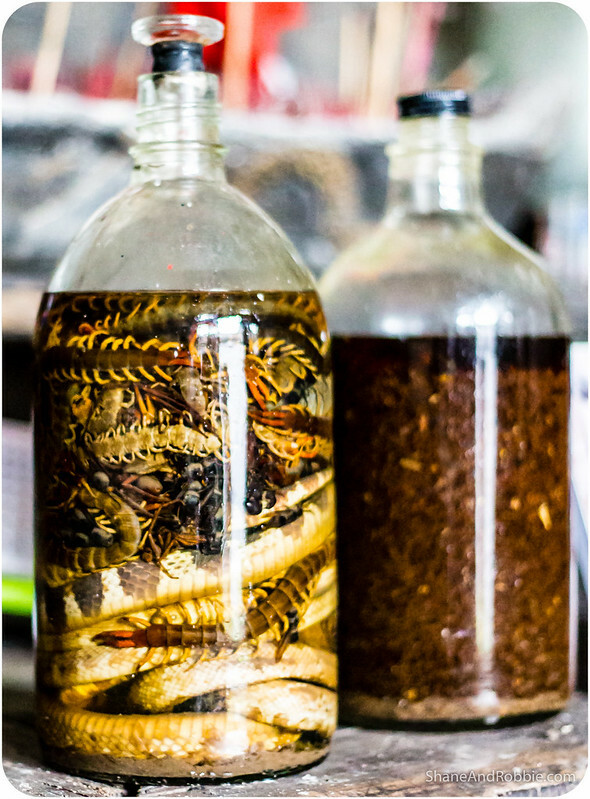 The only part of the meal we declined (politely) was the post-lunch shot of snake and centipede wine. 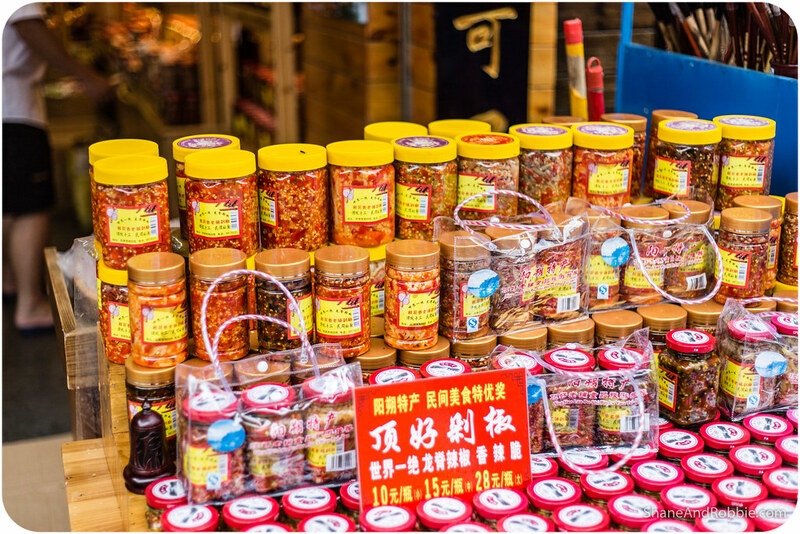 It’s supposedly very good for your health, but the sight of all those dead snakes and centipedes in there just didn’t work for us. *We’ve learnt the hard way that if we finish everything on the plates given to us, our hosts feel obliged to refill the plate as we might still be hungry and they can’t possibly bear the thought of us leaving under-fed. As a consequence we had a couple of meals where food just kept coming and we couldn’t understand why they wouldn’t stop bringing out more! We’ve worked it out now though – the key is to leave just a little on each dish so it looks like we’ve had ample sufficiency of everything. 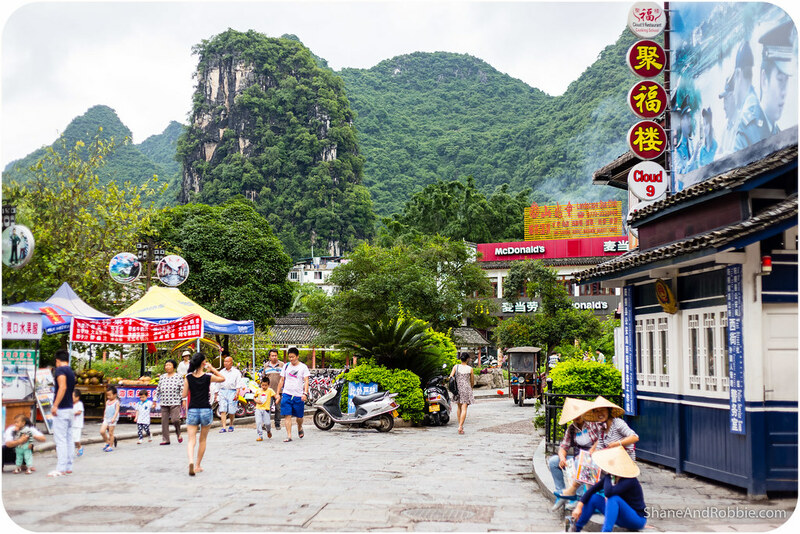 Upon returning to Yangshuo we asked Peter, our guide, to drop us off in town so we could explore a bit of the city ourselves. The town itself is quite pretty, but very touristy. 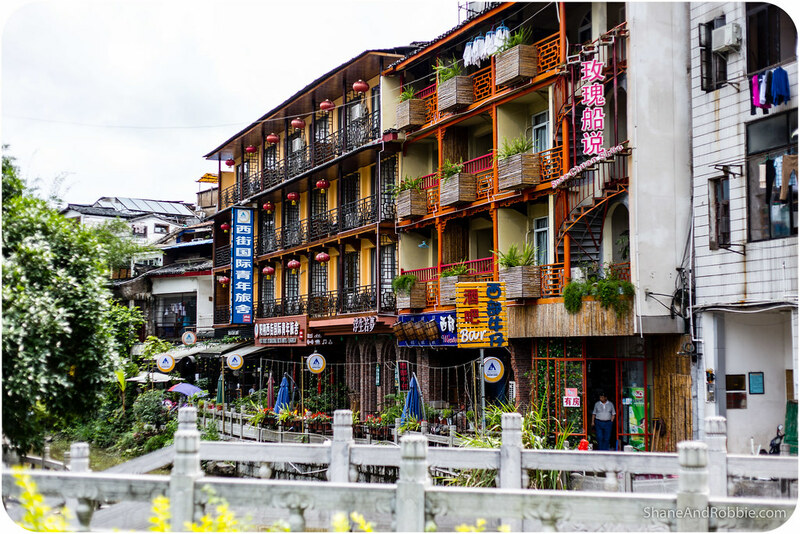 This once sleepy little town, known only to adventurous backpackers, is now well and truly on the main tourist trail and, as a consequence, there are hundreds of shops, restaurants, and hotels all over town. Still, it’s cute enough and exploring the streets was a nice way to spend the afternoon. 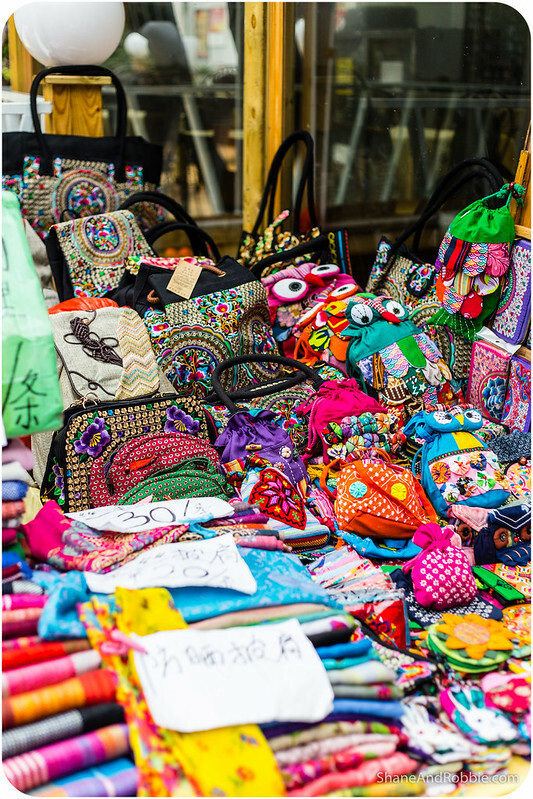 The main street, West Street, has been converted into a pedestrian-only area and is lined with souveneir shops and stalls selling hand-made crafts. 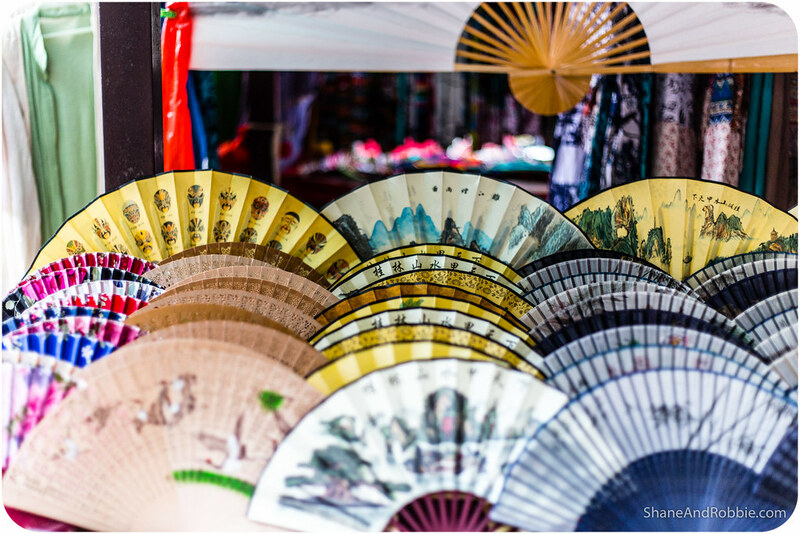 It was fun doing a bit of window shopping and people watching, even if we’re not really in the market for any hand-painted fans, freshly made chilli sauce, or carved yak bones. 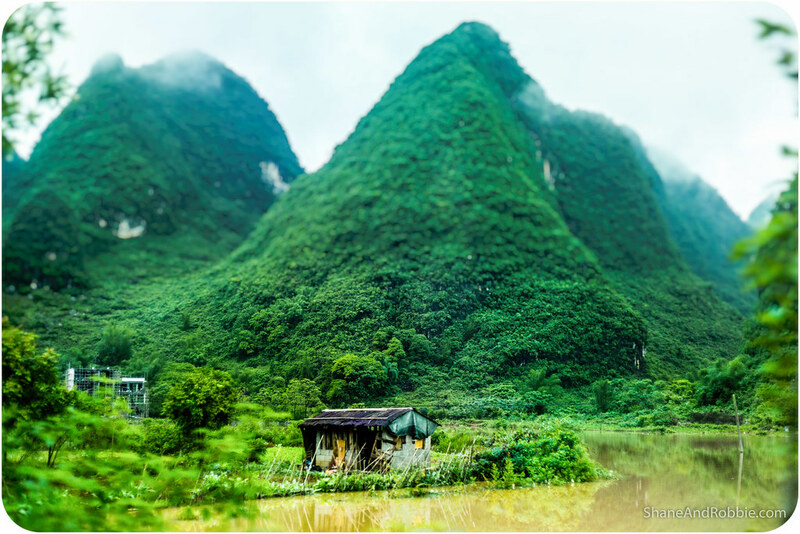 The shapes of the karst mountains are an ever-present background here in Yangshuo, making even ordinary things seem more beautiful. Although the town is obviously not an undiscovered backwater any more, it’s still a cute enough town. 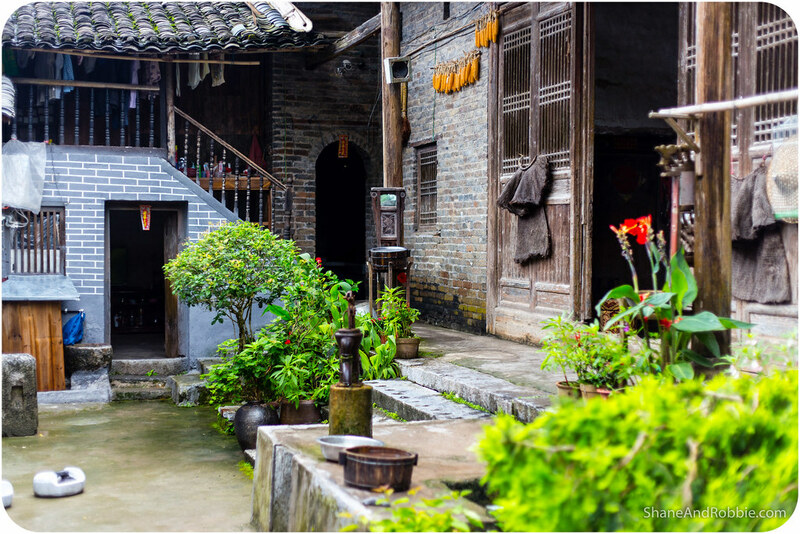 For us, it’s been well worth the visit and we would actually quite like to return to this part of China to see more of the spectacular scenery. The whole region is quite well set-up for travellers (there are even signs in English in places! ), and seems very clean and not too hectic or chaotic. 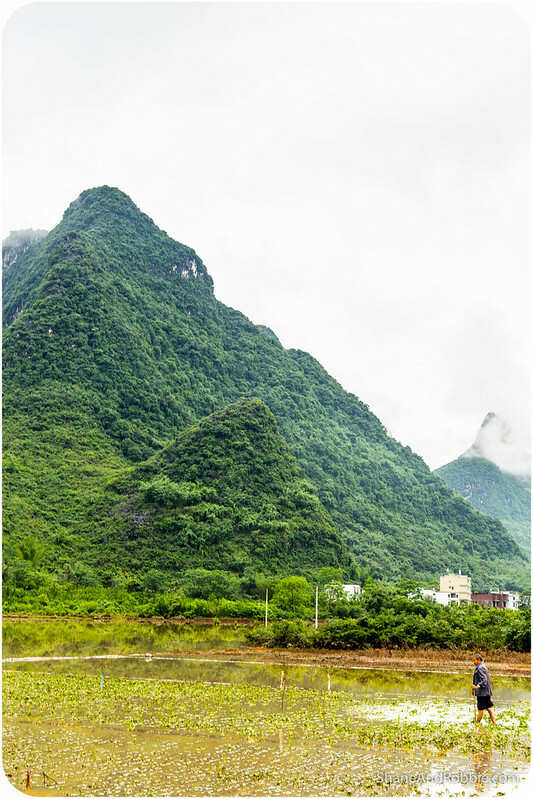 We can see ourselves easily spending a few weeks here, on our own, hiking up some of these peaks, paddling down the rivers (when they’re not in flood), and enjoying more of the wonders of Guilin, Yangshuo and the Li River.